Colonial Williamsburg now has a tea pot that was once owned by the last royal governor of Virginia. This teapot once belonged to the Scottish nobleman John Murray (ca. 1730-1809), fourth earl of Dunmore and Virginia’s last royal governor, which descended through Lord Dunmore’s family, is now part of the Colonial Williamsburg Foundation’s collection. The teapot was made in London in 1771-72 under the sponsorship of the Swedish-born silversmith Andrew Fogelberg. John Murray went back to England after our revolution and the teapot lived there until the recent gift. This teapot has a “loose” lid that means it is not hinged. Apparently this was common practice in Sweden. enters the Colonial Williamsburg collection. The Art Museums of Colonial Williamsburg include the Abby Aldrich Rockefeller Folk Art Museum and the DeWitt Wallace Decorative Arts Museum. The Abby Aldrich Rockefeller Folk Art Museum is home to the nation’s premier collection of American folk art, with more than 7,000 folk art objects made during the 18th, 19th and 20th centuries. The DeWitt Wallace Decorative Arts Museum exhibits the best in British and American fine and decorative arts from 1670–1840. The Art Museums of Colonial Williamsburg are located at the intersection of Francis and South Henry Streets in Williamsburg, Va., and are entered through the Public Hospital of 1773. Expansion of the museum broke ground on April 27, 2017. Once completed, the museums’ expansion will provide a new entrance, improved public access, increased exhibition space and guest services among other enhancements. Museum hours are 10:00 a.m. to 7:00 p.m. daily. 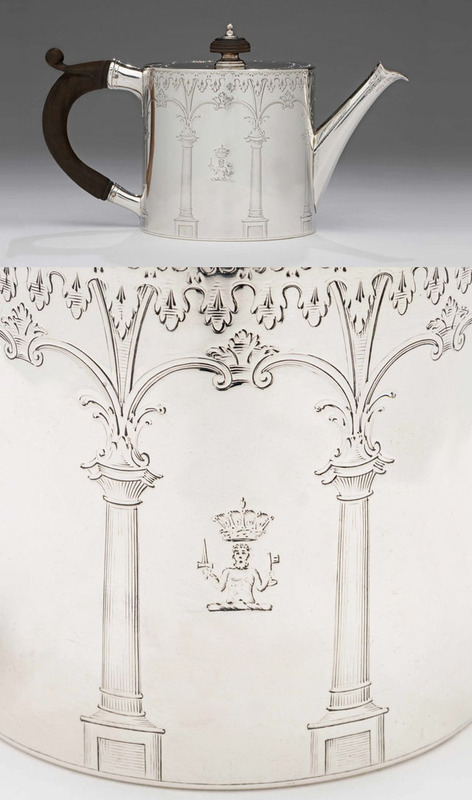 *Image: Teapot, 1771-1772; marked by Andrew Fogelberg, Swedish/English, working ca. 1767-deceased ca. 1815; sterling silver and wood; London, England; gift of Angus Sladen of Hampshire, England, a descendent of the fourth earl of Dunmore, 2018-128. Very good looking teapot and a great story.